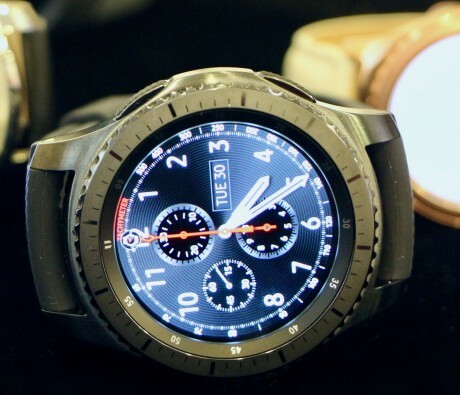 Samsung today announced the Gear S3 smartwatch, a Tizen-based wearable that will be available in several configurations. The Gear S3 will be sold in Classic and Frontier styles. The Classic style has a classier, more conservative look, while the Frontier has a thicker, more sport-centric look. Both the Classic and Frontier will be available as Bluetooth-only models, or with LTE for phone-free calling and data syncing. The Gear S3 features a 46mm face with 1.3-inch round display. An Exynos 7270 processor powers the phone and is accompanied by 768MB of RAM and 4 GB of storage. The battery has been enlarged to 380mAh and Samsung claims the wearable will provide three to four days of uptime. Software refinements are extensive. Tizen OS 2.3.1 brings with it new health and fitness capabilities that are aided by a bevy of sensors, including altimeter, barometer, speedometer, and GPS. The wearable can automatically recognize and track walks, hikes, runs, bike rides, and rowing. An SOS function allows owners to secretly call an emergency contact and send their location data. The device can stream music over LTE or WiFi (Spotify) and pair with Bluetooth headphones for music/calls. The watch offers more options for the always-on display, expanding the color palette from just eight to an unlimited number. Last, the Gear S3 adds full support for Samsung Pay, including NFC and MST for mobile payments. The Gear S3 goes on sale during the fourth quarter. Samsung plans to release an updated Tizen SDK to developers so they may prepare their apps ahead of time. Samsung debuted a new smartwatch in Brooklyn called the Galaxy Watch. This Tizen-based wearable has a classier air about it when compared to last year's Gear S3. Jabra's Sport series of Bluetooth headphones targets fitness buffs who want music and fitness tracking managed by the same wearable. The Sport Pulse and Sport Coach offer heart-rate monitoring and rep counting, respectively, for runners and crossfit lovers. AT&T today said customers can place orders for the Samsung Gear S3 Frontier smartwatch beginning November 4. The wearable, announced by Samsung earlier this year, supports AT&T's NumberSync service, which allows owners to use their main number to make/receive calls and send/receive messages from the watch. Samsung today introduced the Gear Sport smartwatch. The watch includes a 1.2-inch OLED display and measures 42.9mm, which Samsung says should fit most people well. Huawei today announced the general availability of the Watch 2 Classic. This Android 2.0 wearable is compatible with Android and iOS smartphones.